This recipe is a flavourful blend of chicken and vegetables. It is a perfect dish to surely please your family members or guests. Although you can try Chicken Vegetable Soup anytime you want, but it is always better for winters as it helps you remain warm. Take a large soup pot and place 2 tablespoons butter or margarine in it. Place the pot on the stove on medium heat and wait until the butter melts completely. Add in 2 cups of chopped chicken meat and stir fry for 2 to 3 minutes. Now add 1 cup of chopped onion and same quantity of sliced celery into the butter mixture. Stir in 1 tablespoon of chopped green pepper, I tablespoon of minced garlic, 6 cups of chicken broth, 2 chicken bouillon cubes and ½ teaspoon of thyme. Stop stirring for some time and bring mixture to a high boil. It is the time to add 1 cup of diced potato and ¼ cup of diced carrot into the mixture. Reduce the heat range of your stove to medium-low and let the chicken-vegetable mixture for 15 to 20 minutes or until all ingredients are equally tender. Remove the soup pot from heat and carefully pour it into a large mixing bowl. Quickly pour ½ cup of light cream and use a large spoon to stir the soup until thick, uniform and soupy. Arrange four medium soap bowls in an order and equally divide the chicken vegetable soup among them. 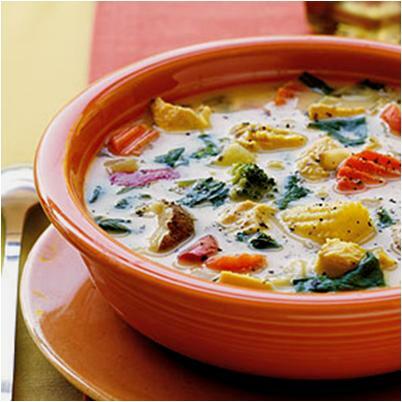 Garnish the chicken vegetable soups with some freshly grounded black pepper and serve without any delay. Chicken Salad is probably going to be the perfect side-dish for your chicken vegetable soup.